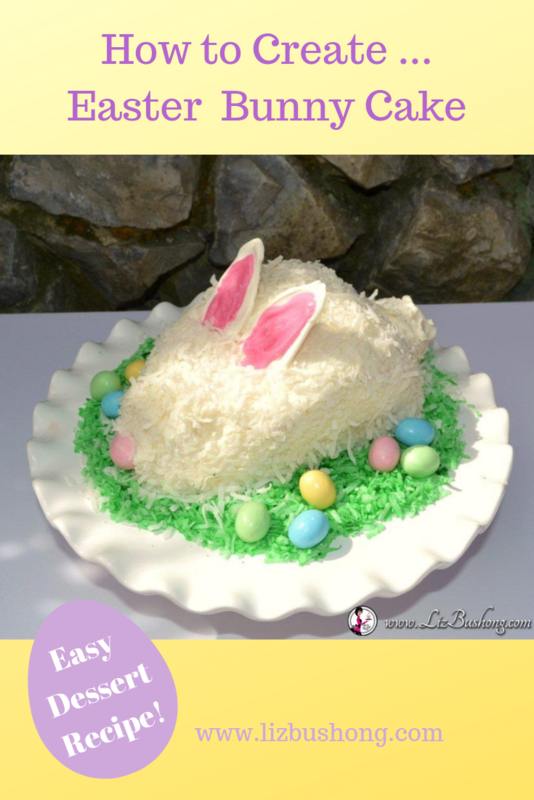 Just in time for Easter Dinner or Spring Parties, the bunny cake takes shape pretty easily, it is made from a 6″ round coconut cake cut in half and shaped like a bunny. The bunny ears are made from melted candy melts and the cotton tail is a frosted cream puff. You will love making this small creation, it will serve about 8, but she is so cute sitting on the buffet table. Read more to see how to shape the cake, frost and decorate. 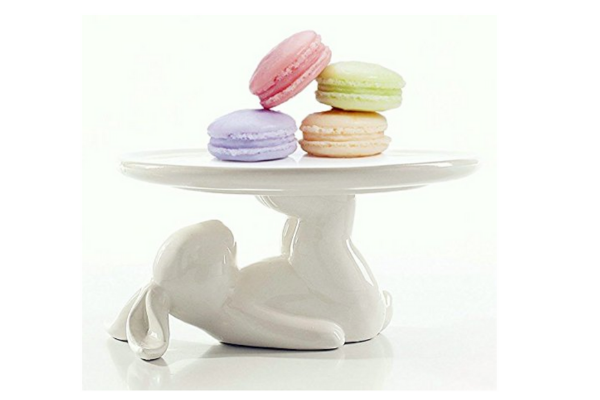 Perfect for a table centerpiece or your buffet at Easter this small cake will be the hit of the party! 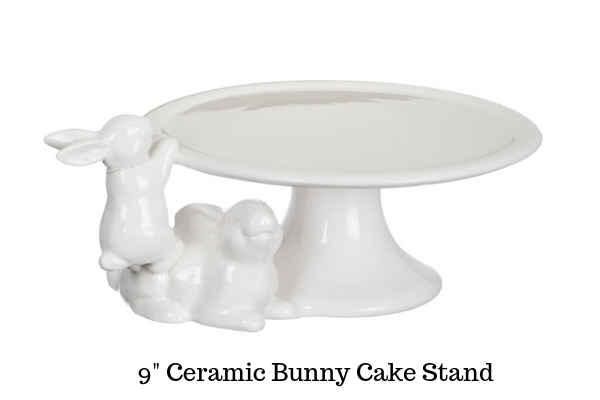 This recipe will make two 6″ round cake layers or two bunny cakes. If you just want one cake, bake one 6″ round and make cupcakes with rest of cake batter. You could decorate the cupcakes like nests, using white frosting, green coconut and leftover almond M & M’s. Preheat oven to 350F. Line 6″ round cake pan bottom with parchment paper, spray pan and both sides of paper. Set aside. Make Candy Melt ears, set aside. In large mixing bowl, add cake mix, dry pudding mix, eggs, water, oil, extract. Beat on medium speed 2 minutes, be sure to scrape down sides and bottom of bowl. Bake 350 for 20-25 minutes or until center of cake is done. Remove from oven and cool 5 minutes, turn cake out of pan onto work surface. Cut cake in half, frost one side, stack cake together and sit cake on side with rounded side up. Cut a wedge about 3″ from one end of cake for head/ears. Save cut piece and place in front of the cake for a face. Fill pastry bag with tip # 5 with frosting. Pipe frosting ( like glue) cake piece to front of cake and pipe a frosting tail or attach cream puff. Frost entire cake with Vanilla Buttercream Frosting. Cover cake with 2 cups of coconut. Attach candy melt ears on wedge that was cut out with piped frosting. Toss 1 cup coconut with 2 drops of green food coloring gel in small zip lock baggie to color coconut like grass. Arrange grass coconut on serving platter/cake stand, position bunny, attach nose Almond M & M-to cake with frosting and scatter remaining M & M’s around base of cake. 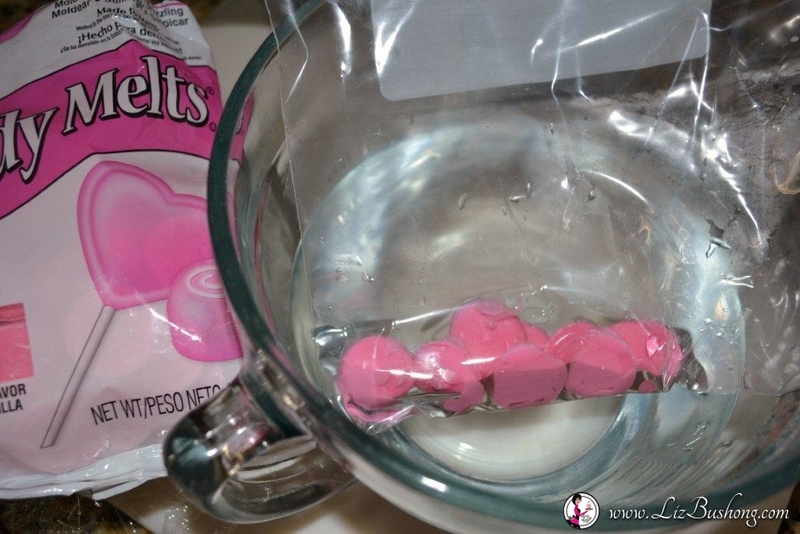 How to make Candy Melt Ears: Place white and pink candy melts in two separate zip lock bags, seal bag. In large glass mixing bowl, add 3 cups water, heat water in microwave for 3 minutes. Remove from microwave and allow melts to melt in heated water. Massage bags to ensure melts have melted. 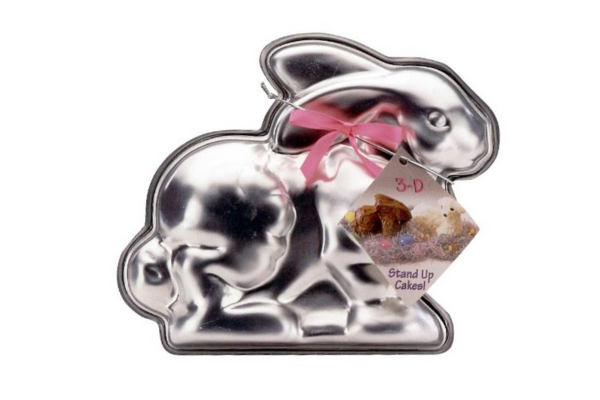 Clip tiny end off each bag, pipe on wax paper or parchment, two bunny ear shapes with white melts first. Let harden, then pipe pink melts to center of each bunny ear center. Make bunny ears ahead of baking cake so you will be ready to decorate cake after frosting. Cake should be a firm cake to hold shape. Freeze cake after cutting in half and before cutting space for ears to allow for easier cutter and firmer surface for frosting. Prepare the ears for the bunny cake using candy melts or white bark. Melting the candy bark or melts in a zip lock baggie that is sealed well in a bowl of hot water, will allow the melts to melt evenly and with out scorching. When you are ready to make the ears, dry off the baggie, massage the melts so they are completely melted and clip one end of bag to pipe into ear shapes. I used white for the ear and electric pink for the inner ear. Allow these melts/ears to harden before adding to the cake. Toss coconut in a zip lock bag with green food coloring to tint the coconut a grassy green. Keep in baggie until ready to use. Make butter cream frosting or purchase a can of frosting. Don’t use the whipped kind, I found it to be too thin for covering my bunny. You could use whipped cream, but then you would have to keep the cake refrigerated. Canned frosting is good or make your own. Baking white cake in 6″ baking pans. One cake mix will make two separate bunny cakes. Frost top piece of cake and sandwich together, then flip over so rounded side is up and flat side of cake is sitting on the work surface. It is good to see how the bunny ears will lay down on the cake before frosting the cake. You might need to do some more trimming to make the ears look normal. Don’t worry about the crumbs in the frosting. Just a bit more frosting after this sets up ( crumb coating) and while frosting is wet, add the shredded coconut all over the cake. Hope you have a wonderful Easter and Hoppy Spring!